Deidre's Discoveries: Dollar Store Finds! In the summer, and beginning of fall, I was living away from home in a small town. They had a Shoppers Drug Mart, which was nice, but that was it for make up. The next town over had a Walmart, and okay again for makeup, but everything was the same. I noticed one day that they were getting a new dollar store (I forget the name now... oops!) so I wanted to check it out. I noticed there they had a tiny makeup section, I wasn't expecting much because our Dollar Tree's don't have nearly as much selection as the States, and I figured this one wouldn't either. Surprisingly, they had a Jordana section. I've read about this brand on other blogs, and I knew it was just a cheap line, but I wanted to give it a try for myself. Plus, it's a dollar store - it's not expensive. If I didn't like it, then I didn't spend a lot of money on it. They had a decent selection, and not wanting to go too crazy, I only picked out two items. A nail polish and a lip balm. 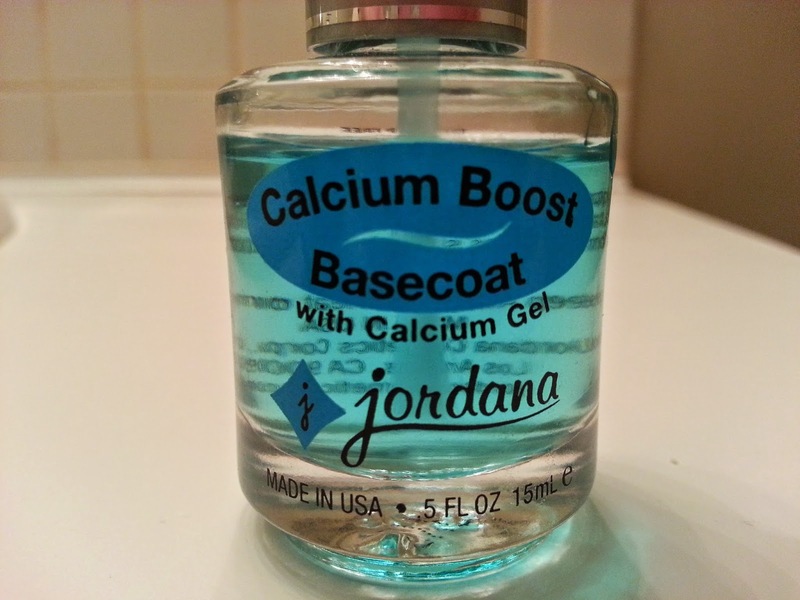 This is the Jordana - Calcium Boost Basecoat. I saw that they had a spot for a nail strengthener, but they were all sold out, so I figured this would be okay to try too. The Calcium Boost Basecoat says it is for dry brittle nails. My nails sometimes peel, and they had been through a lot in the summer, constantly washing my hands, so I figured this might help. I haven't noticed a huge difference in my nails, using this on and off throughout the past few months. They still peel sometimes. Also, I find after applying, this has a blue tint on my nails, even if I only apply a light thin coat. I probably wouldn't repurchase this exact basecoat again, but I would try others from their polish line. It doesn't chip off too easily compared to other basecoats I've tried in the past. I paid only $2 for this basecoat, which is a bargain to me. 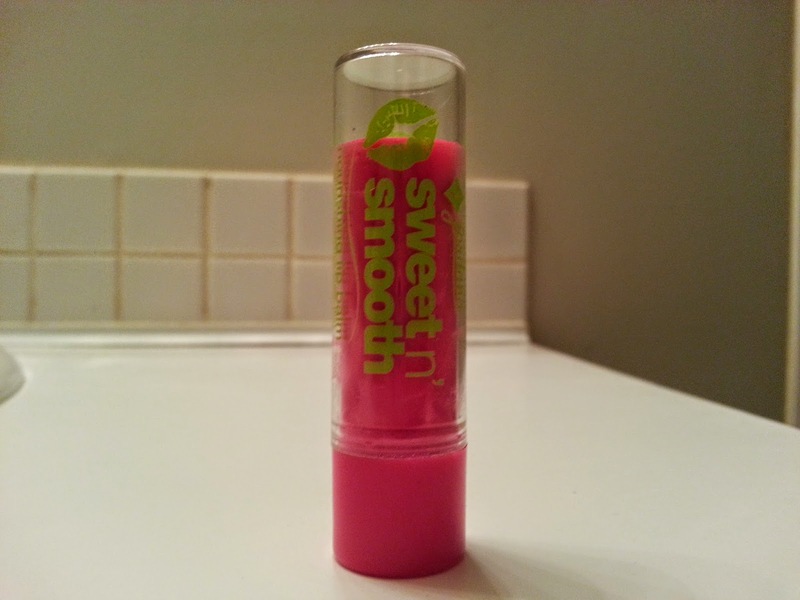 The second item I picked out was Jordana - Sweet n Smooth Nourishing Lip Balm in (03) Tasty Watermelon. This looks very similar to the Maybelline Baby Lips, which I own one of. So I wanted to compare the quality, since this was a little bit cheaper. When I got it out of the store and I compared it side to side, and the baby lips is a tad larger. The colour of this one could be built up on your lips, so you could have just a light sheen or a darker one. Just like the baby lips. I would say though, that this isn't as nourishing feeling as the baby lips. It feels a little thicker as well and doesn't go on as smoothly. But, if you're looking for a cheaper product, that is similar, and not pay the Maybelline price tag - then I would say they are still close enough. I paid $2 for this as well, which again is a bargain to me. I think I paid almost $4 for my baby lips. I swatched the "Tasty Watermelon" lip balm, and the shade is a little brigher than expected, but it's okay because it can be built up. On the top, I went over about 3 times, and its a lot darker. The bottom I lightly applied only once, so you can see that you can build up that brighter colour. 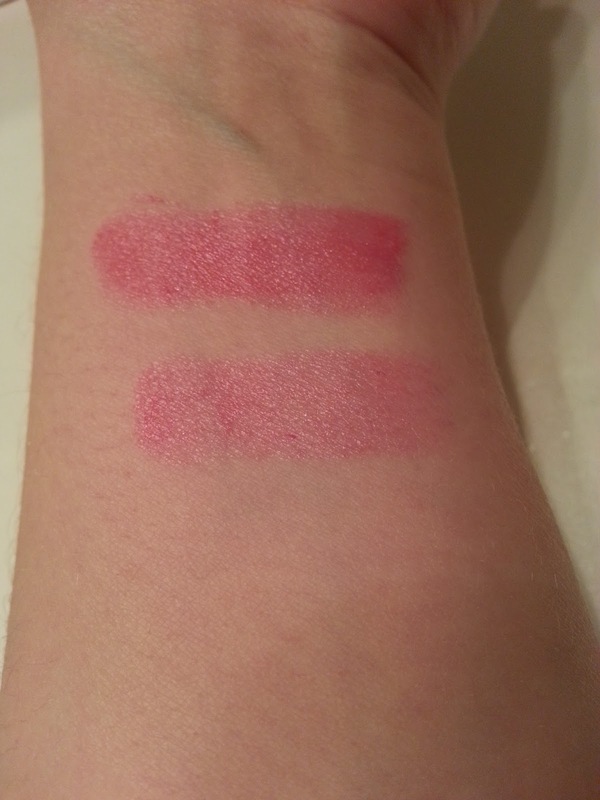 I would probably repurchase both of these items again, at the price they were, but in a different formula for the polish, and I would try more colours in the lip balm. $2 each are both inexpensive to try!